A Major Goof . . . a Rookie Genealogist Lives and Learns. Oh dear. I found out yesterday that my work on a whole line of ancestors is wrong. 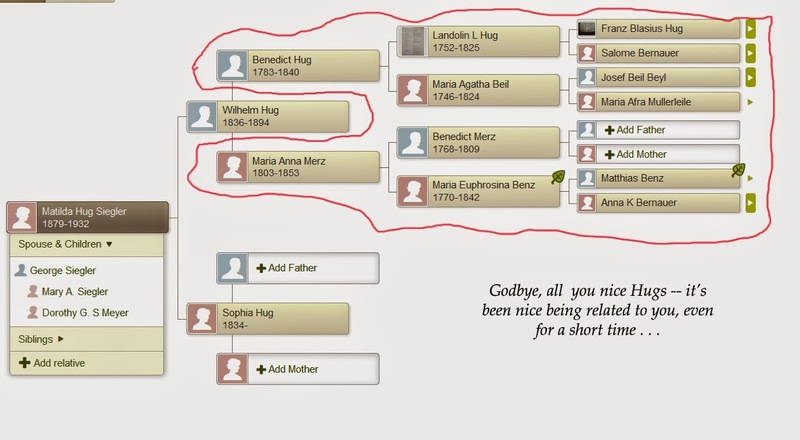 The Hug ancestors are not from Baden-Wuerttemburg but rather from Hanover (the former Kingdom of Hanover, not necessarily the city of Hannover). Goodbye to Blasius and Landolin, Salome and Maria Euphrosina -- it's been nice thinking about you, but we're not related after all. 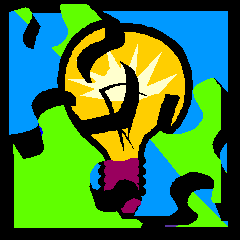 The puzzle falls apart (that section of it, anyway). How did this happen? Well, in following up on hints on Ancestry.com, I communicated with a woman who was very experienced and who had the Hugs as a minor branch of her family tree, joined by marriage to her ancestors. The key person is Wilhelm/William Hug, who came to the US from Germany some time prior to 1860 (when he shows up in the US census). She had a great deal of information, both from Germany and from the US, but there were two problems: 1) she had documentation of Wilhelm Hug from Baden Wuerttemburg in the right time frame, but no documentation of that specific person arriving in the US, and 2) the William Hug who is absolutely our great-great grandfather stated his birthplace in a census as "Prussia," as did his wife. 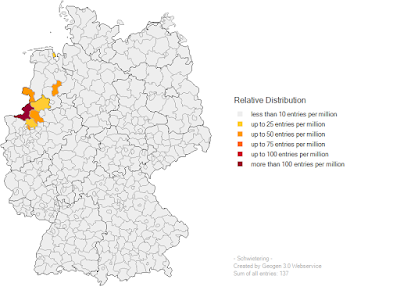 Baden is nowhere near Prussia -- it's way in the south of Germany, while Prussia was in the north. I brought this up with the other Hug researcher over a year ago, and she remained convinced that she was right. So I left the whole Baden Hug clan in our tree. But it has been nagging at the back of my mind. 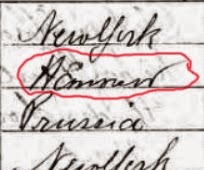 If we ignore the little flourish over the second letter that makes it look like a capital E (I think it's ink bleeding through from the other side of the paper), those words are very, very similar, and that was the consensus of experienced people on the German Genealogy page as well. 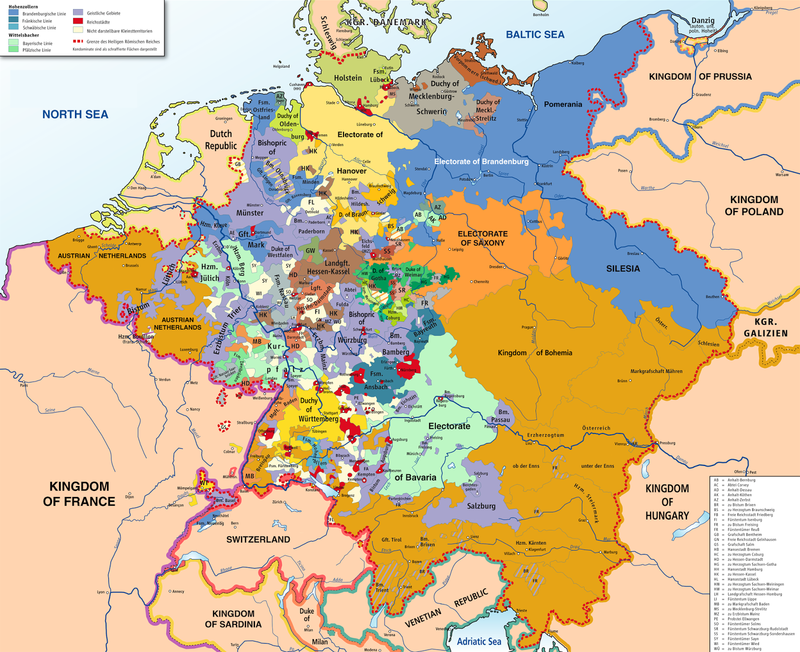 Our great-great grandfather was most definitely not from Baden-Wuerttemburg, but from the old Kingdom of Hanover, so that's what I have to pin down at this point. And many, many hours of research on the Baden Hugs go down the drain. How did this happen? First and foremost, I allowed my doubts to be overridden by a researcher who was more experienced and very confident, even though I had information that strongly suggested she was wrong. I also went ahead with researching that branch of the family, even though I didn't have that one piece of documentation nailed down. All those circled in red have fallen from the tree, unfortunately . . . Still, I learned a lot from pursuing this line -- the status of illegitimate children, the guild system leading to being a master craftsman, much about the surrounding area -- and also, not to take someone else's word, no matter how confident they are. See the documentation with your own eyes, or don't use it! I'm really, really sorry, though, to lose an ancestor who might have seen Marie Antoinette on her progression to be married in France. (See this post for more on Marie Antoinette). Oh well -- even after doing genealogy for a couple of years, I see that I still have much to learn!